KingWear is being around for quite a while now and the Chinese company is really working hard enough to take over in it’s own niche of affordable smartwatches that can function 100% on it’s own without necessarily needing a smartphone. The company’s new KW99 is another powerful Android Smartphone/smartwatch for those that wants something that is super-dopey. The device is a mini Android smartphone but since it’s strapped on to your wrist, it does the functions of a smartwatch which makes it a very handy device that anyone seeking to buy something that isn’t as expensive as Samsung Galaxy Watch or the expensive Apple watch, this a really moderate alternative considering it’s pricing. While it might not be able to perform like a $500 worth smartwatch, some people only want something that is affordable and can do the job. The KW99 for example is a very handy smartwatch and it has all the features anyone would ever want like it’s nice and premium design. KingWear like Umidigi is a great packager considering how cool their product packages use to be. The KW99 box for example is made of a very dense cardboard making it look like some high-end tech with lots of dollar investment. While moving the product from such a long distance like China can have some negative effects on the device’s packaging, that doesn’t affect the visible beautiful design you’ll come to notice on the device’s box when you see it. The device when opened consists of the owner’s manual and the power cable which are both tucked away with the device itself all inside the same box. To be more specific, the box contained a 4-pin magnetic cable for charging as well as for transferring media to and from the smartwatch. Some sellers put two such wires, and, given their prevalence, this is definitely a plus. Also in the kit is a screen protector (which I thought was a nice touch) to protect the display from nicks and scratches. In addition, there is a small cross-head screwdriver, which is necessary to open the cover of the nano-SIM compartment. The standard is the manual. Looks simple, only in Chinese and English, but with pictures. Don’t forget the older KW88 with it’s rubber strap and how nice it looked. Even the KW99 is another amazing device with amazing design and appearance. The device’s bezels are made up of aluminum which is said to be anodized to prevent the metal from losing it’s color finish while you are using it over time. The saddening thing is that color option is very limited to just silver unlike the KW88 with 3 to 4 colours. The device has a rounded screen just like other Android smartwatches. The rounded display is framed by metallic border on which there are marks in the forms of time intervals ranging from 1 to 12. The display isn’t as huge as other Chinese smartwatches in the league but the touch functionality is still applicatble despite a big power button that looks like a clock wheel which is used when pressed down. Before the straps fastener is the mini microphone hole. On the left is a speaker and the KingWear KW99 seems like it’s a waterproof device. I wouldn’t agree to that just yet considering the fact that it’s IP68 rated and I didn’t personally dip it in the water. Right at the back, the KW99 has a plain back like most other smartwatches. At the edges on the back, the screws are easily visible. Also on the back, in the very center, there is a heart rate sensor. There is also a slot under the SIM-card, which is covered with a plastic plug and fastened with a screw. The KingWear KW99 runs on Android 5.1. This is “pure” Android, not Wear, which is famous for branded devices. The system is slightly curtailing but it did not affect the comfort of use and work. In fact, there are a very few smartwatches with all these specifications. Smartwatches are adapted to gestures which you quickly get used to. The great thing is that it comes with Play Store which allows you to install everything your heart desires. Of course, do not forget about the small screen and the not so productive hardware. And although smartwatches can work fully without connecting to other devices, many will be interested in additional features. KingWear KW99 can be easily connected with smartphones running both Android and iOS. 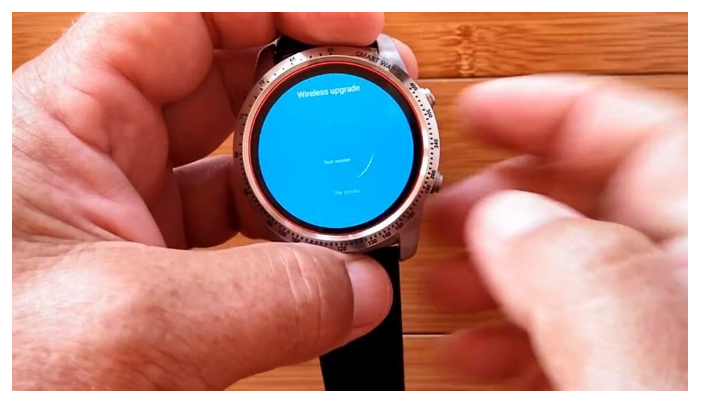 To do this, use the “Mobile Assistant”, you will find this function is in the smartwatch settings. Once you select it, a barcode will appear which you can then scan with the camera of the smartphone. The pedometer counts the number of steps walked by the user. The information is displayed in a special application; it can easily be synchronized with the “Mobile Assistant”. The KingWear KW99 smartwatch comes with a wide array of cool features. I did not have any complaints or issues while I tested out the watch. Smartwatches normally cost a fortune, but the KingWear KW99 is definitely one of its kind considering that it costs less than $100 and offers features that any high-end smartwatch has to offer. I think this smartwatch is definitely a must buy.